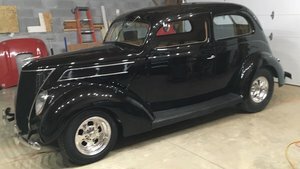 1937 Ford 2 door Sedan Slant Back Street Rod, All Steel,302 Ford Crate Roller Engine with 600 Edelbrock Carb, e-303 Cam, Ceramic Coated Headers, Rated at 400 HP, C-4 Transmission with 2200 Stall, Mustang 2 front End, Chassis Engineering Leaf Springs in rear, 4 Wheel Power Disc Brakes, Power Rack and Pinion Steering, 3:01 Rear Ratio. Power Windows, Door Poppers, Power Driver\'s Seat, Flaming River Chrome Steering Column, etc. Custom Cream leather interior with custom bucket seats, and center console. Everything is fresh or new. This car is all steel and has absolutely No Rust Anywhere.